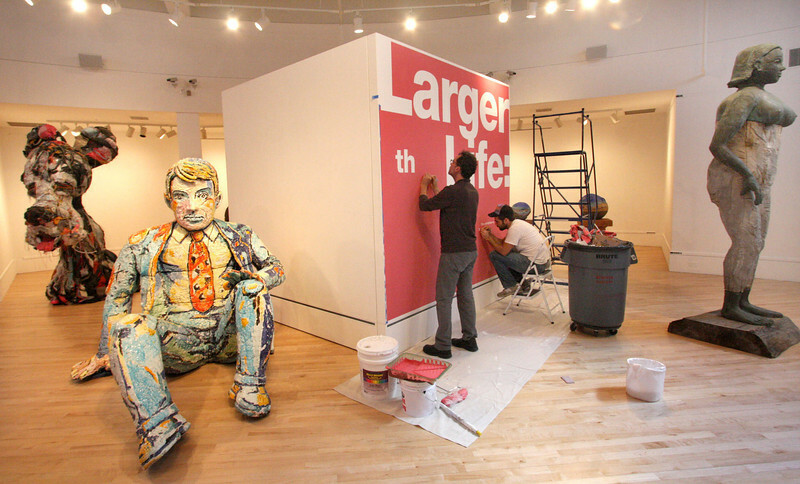 Don't miss "Larger than Life: Exploring Scale in Contemporary Art," on view from June 2 through August 18 at Walnut Creek's Bedford Gallery at the Lesher Center for the Arts. 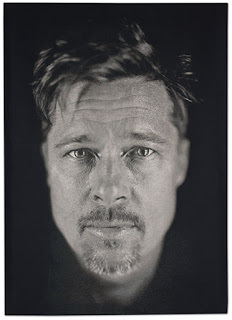 Curated by Carrie Lederer, the show features artists whose work investigates "the oversized, overstuffed, and uncanny elements in art" and includes a 2009 tapestry portrait of actor and philanthropist Brad Pitt by Chuck Close, published by Magnolia Editions. 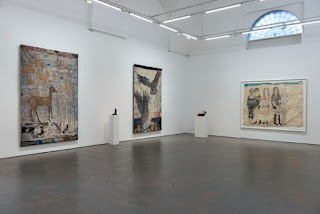 As if to publicize a private epiphany about arriving at the brink of middle age, Pitt requested that artist Chuck Close, known for his superdetailed daguerreotype portraits that reveal every skin flaw, shoot the pictures accompanying this story. [...] Close suggests that the actor, who showed “no vanity” during the sitting, is once again playing with public perception. 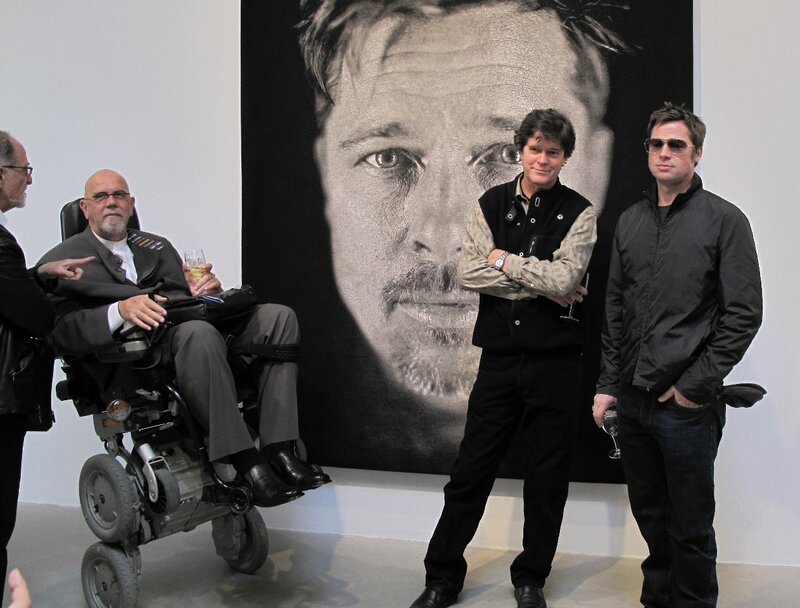 Michael Danoff, Chuck Close, Donald Farnsworth, and Brad Pitt at PaceWildenstein with Close's Brad; photo by Lewis deSoto. The show also includes fascinating work by Tristin Lowe, Elisabeth Higgins O'Connor, and Viola Frey, among others. Please visit the Bedford Gallery website for full details. Open Studios June 8-9th: See our new gallery! Builder Jack Champion (foreground) and architect Marisha Farnsworth (right) in what will soon be Magnolia's new gallery space. Magnolia will be open to the public from 11 am to 5 pm on Saturday June 8th and Sunday June 9th, 2013, the second weekend of the annual Pro Arts East Bay Open Studios event. This will be a very special Open Studios for us: as you read this, the front portion of our warehouse location in Oakland is being completely torn out and renovated. Visitors to Magnolia will soon enter through a brand new gallery space, with walls tall enough to accomodate even the largest tapestry editions. The upcoming Open Studios will be an unofficial grand re-opening of sorts; please come celebrate with us beneath the high ceilings and abundant natural light of our handsome new gallery! Due to the recent construction, we have unearthed a treasure trove of empty frames which will also be available for sale at bargain prices during Open Studios. These sale events at Magnolia only happen two or three times a decade, so please mark your calendars, arrive early, and be sure to bring your fellow art lovers! We look forward to seeing you here.